It’s true. There’s no standard laundry room size, shape or layout. Often these utility spaces are created in awkward leftover areas after every other room in the home has been planned out. Or they’re banished to dark corners of basements and garages. And yet you’ve probably noticed you’re spending a lot of time in that confined area. Shouldn’t that space warrant extra attention? 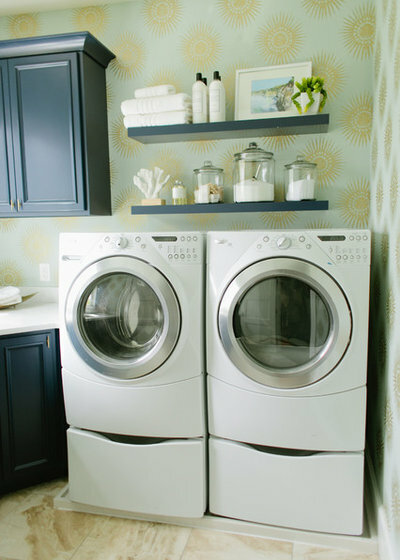 This step-by-step workbook will help you think through your options and plan some ways to make your laundry room function better and look nicer. Step 1: What Are You Hoping to Achieve? 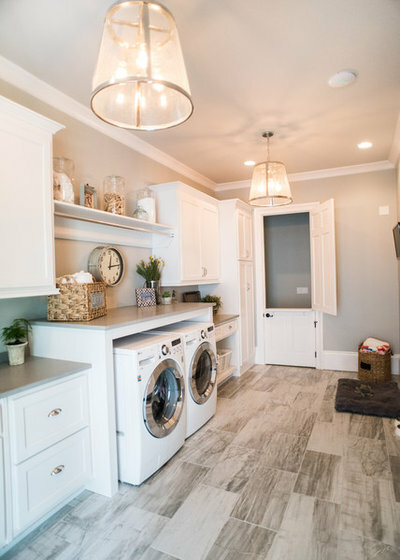 Why have you decided to remodel your laundry room? And what’s important to you? The answers to these questions will inevitably affect your decisions and, above all, your budget. Are you simply after more function? Or are you hoping to make the space look nice too? Do you plan on working with the space you have? Or are you relocating your laundry room to another part of your house? Buying new appliances and adding some paint or wallpaper is one thing; knocking down walls, rerouting plumbing and building an entirely new room is another. Another question you should ask is, “Why now?” It’s good to think about why this is the right time to remodel or redecorate your laundry room. Is this a one-off project or part of a larger remodel? If you plan on eventually tackling a larger project, such as a kitchen or master bathroom, it could be more cost-effective to wait and do everything at once, when you’ll probably already have a contractor, tile installer and other professionals on site doing work. How Do You Want the Space to Function? 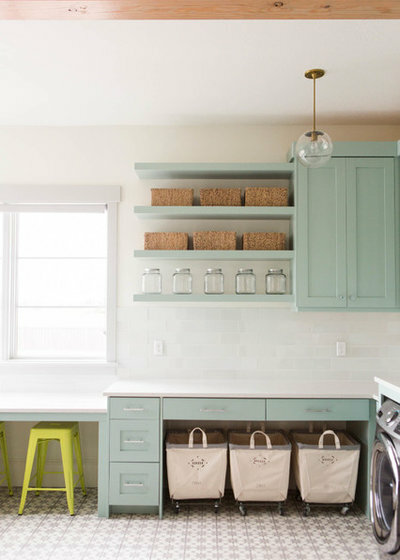 Laundry rooms aren’t always just about washing and drying clothes. “People tend to store all kinds of things in their laundry rooms, from batteries to flashlights to dog food,” says designer Margaret Donaldson. 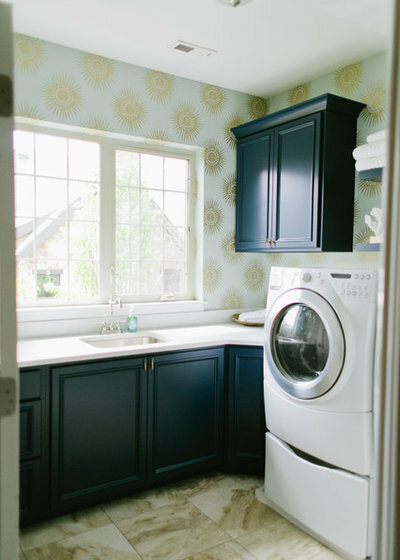 The laundry room shown here was part of a new home and features custom cabinets, granite countertops and blue and green tile laid in a chevron pattern. The way you wash, dry and fold clothes will dictate how your new space functions. How often do you do laundry? Once a week or every day? If you have a large family with multiple hampers, maybe you want to set up a system of individual baskets that better organizes laundry for each member of your family. Where do you fold clothes? 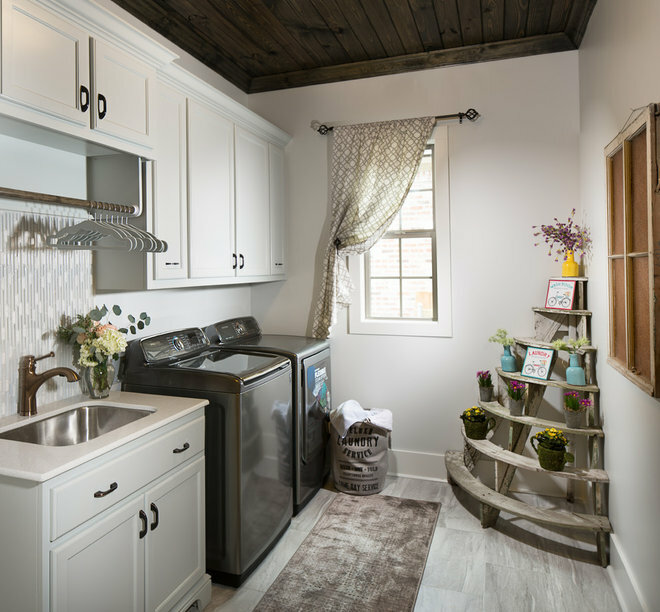 Do you prefer to fold everything in the laundry room and then carry it to the bedrooms? If so, adequate counter space will be important. Maybe you want to consider a large island if your budget permits. Or maybe you like dumping clothes onto the sofa so you can watch TV while you fold. If that’s the case, maybe counters aren’t vital for you and you’d rather use the space for something else, such as more storage cabinets. Also, if you like to hang up clothes right away, maybe you’ll want to make sure you get a hanging rod in your space. Have lots of delicates? Perhaps drying racks are in order. Do you iron often or prefer to use a steam setting on your appliances? When do you do laundry? If it’s during the day, does your space have natural light? If not, could you consider adding a window? If you prefer to do laundry at night, maybe adequate artificial lighting is more important to you. If you’re worried that your laundry habits might not be the most efficient way of doing things and you’re unsure of how you can make them better, it’s probably a good idea to bring a professional onboard for help. He or she can help you think through the way your space should function and even offer up solutions you might not have considered. What Kind of Appliances Do You Want? The selection of your appliances, or your existing appliances, will greatly affect other decisions for your space. For example, do you have or want side-by-side or stacked appliances? Stacked appliances can save space, but shorter people might need a step stool to reach the top controls. Do you want or have front-loading or top-loading appliances? Front loaders give you the option of adding a countertop for folding and sorting, but some people say front loaders often don’t drain sufficiently, leading to mildew inside the machine. Designer Donaldson says that may be the case with older models but that many manufacturers have sorted out the issue with newer models. “Certain models have improved the mildew getting caught in the door,” she says. “Newer front-loading models have systems in place to alleviate the problem.” At any rate, it’s best to do thorough research. If you go with top loaders and still want folding space, you’ll need to figure out where you can install counters elsewhere in the room. As for boldly colored appliances, make sure you’re absolutely in love with the hue and that you’ll be able to coordinate it with the rest of your decor. Bright-colored, hulking appliances may not be the thing you want to draw attention to. Designer Ryan Williams of Artisan Design Studio advises against colored appliances, in fact. “Neutral colors that sort of recede allow more eye-catching decor to draw the eye,” she says. She also removed a chunk of cabinetry above the appliances and hung floating shelves to help break up the heaviness of the cabinets. Another cost-effective design move was the wallpaper, which picks up tones in the marble floor and helps cheer up the space. Krason estimates this makeover cost between $5,000 and $6,000, including appliances. 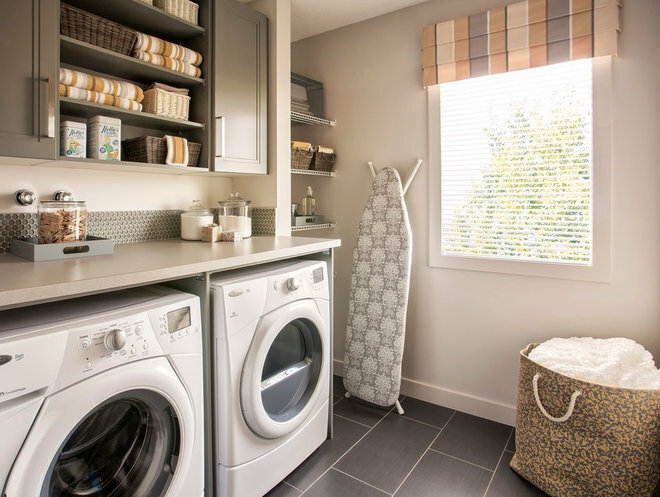 Once you have the basic function of your laundry room pinned down, it’s time to look at your budget again to see how you can make your space more comfortable and stylish. 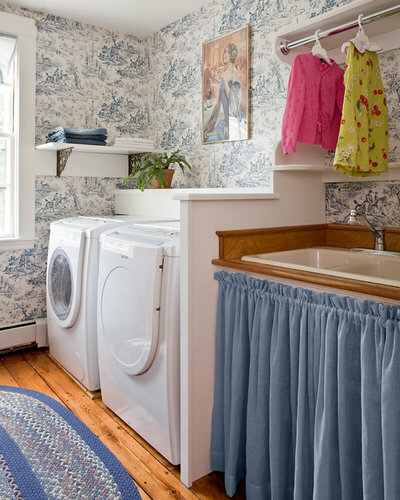 Use Houzz to create an ideabook of photos of laundry rooms you like. Counter space for folding is perhaps the most popular special feature. If you’ve got front-loading machines, consider adding a countertop above them. Or if you’ve got the space and budget, consider a large island on which you can spread out all your laundry. As for countertop material, stick with something durable, such as quartz. You want a material that can stand up to spilled detergents and bleach. The second-most requested special feature is probably a deep sink for soaking or hand-washing delicates and a spray attachment for the faucet for doing spot treatments. There are even sinks that do the hand washing for you, such as MTI’s Jentle Jet laundry sink. For this project, designer Williams enlarged an entry space to include a laundry area, mudroom, small home office and space for a dog bed. A durable Caesarstone countertop runs above these front-loading appliances. Before beginning any home project, you need to know how much you can spend. A new washer and dryer can set you back a couple of thousand dollars right off the bat. Moving plumbing around, adding a sink or window and building custom cabinets are also significant costs. 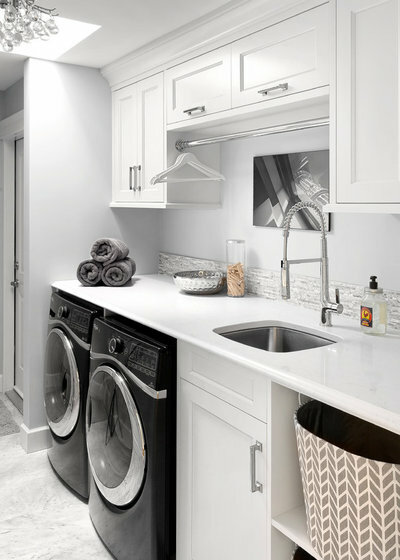 On the other hand, laundry rooms are typically small spaces, and if you already have good appliances and adequate storage, the cost of making over your space could be as low as the price of paint or wallpaper. It all depends on the level of design you’re striving for. Some people just want their laundry room to function. So decide if this is a space where you want to invest or if that money could be put to better use elsewhere. To save money, decide what you can keep and what you need to replace. Can you get by with painting or refacing the existing cabinets rather than replacing them? Can you make do with the flooring? Buying appliances during holiday sales or buying floor models can also help keep costs down. 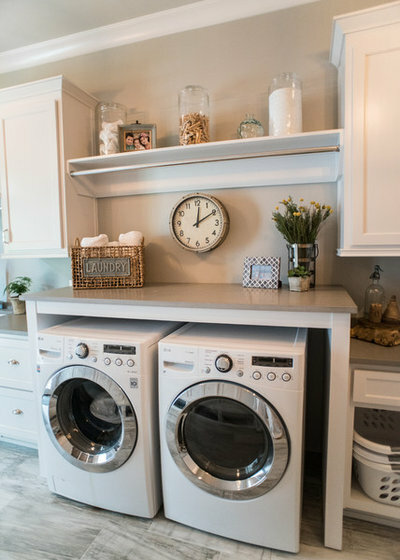 If you’re moving your laundry room to a new location in your home, you’ll have to think about venting, plumbing, draining, knocking down walls and more, all of which add significantly to the cost. 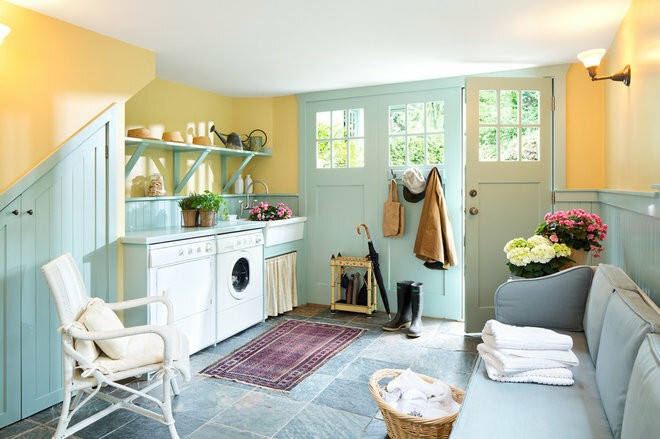 The clients of designer Andi Wheelband of Two Birds Design wanted to move their laundry room from their dark basement to the second floor, where all the bedrooms are. 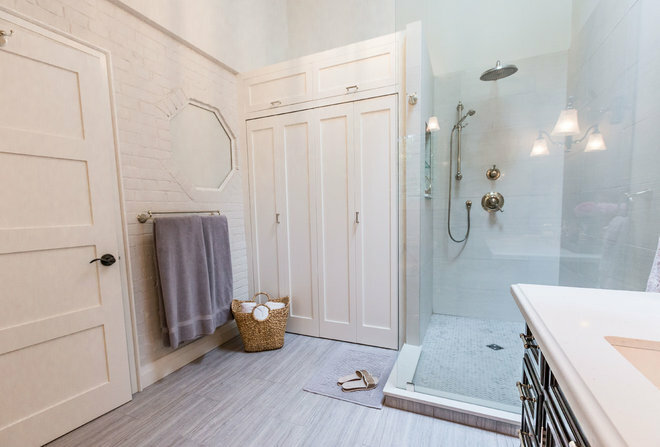 While adding this en suite master bathroom above an attached garage (you can see the former exterior brick of the house on the left), she was able to carve out space for a custom laundry closet, seen here. After determining the general scope of your project, you’ll probably have an idea of whether you need to hire a professional for help. If you’re doing a major renovation, you’ll want to assemble a knowledgeable team to make sure things run smoothly. A professional can help you think through problems and offer solutions you might not have thought of, such as adding a window for natural lighting. 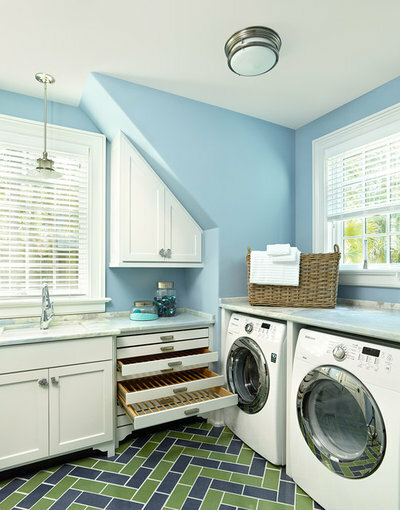 “If your laundry room is on the back of the house, it’s especially easy to add a window,” says designer AJ Margulis. Once you’ve tackled the functionality of your space, consider spiffing things up a bit with paint, wallpaper, tile and accessories. 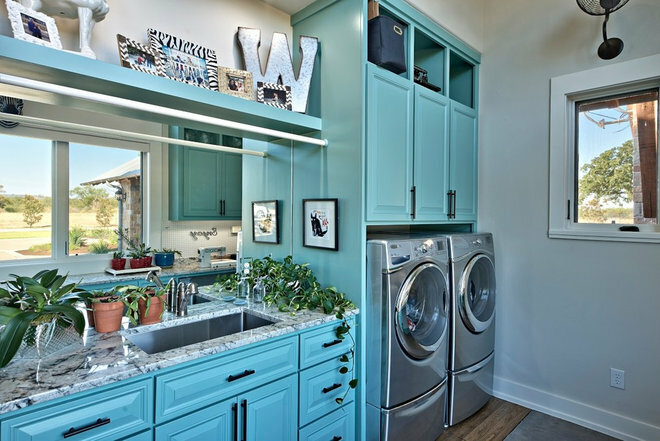 If your laundry room is tucked out of the sight of guests, you might want to consider experimenting with some fun, energetic colors or prints. The more visible your space, the more you’ll probably want it to look nice. 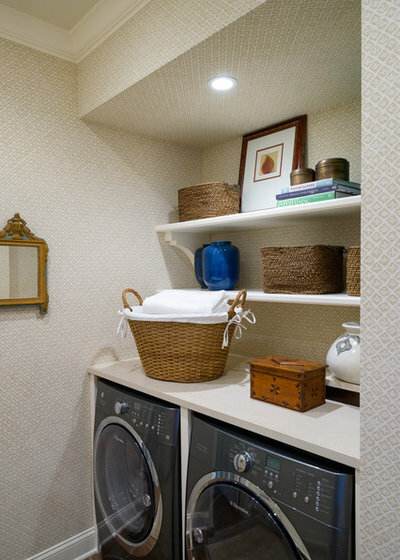 A laundry area in a side-entry mudroom that guests and family members often pass through might warrant some extra attention. On the other hand, if your laundry area is in an unfinished basement where few people ever venture, then looks might not be as important to you. Krason likes open shelving to help break up heavy cabinetry. She also likes ditching the neon-colored detergent boxes for decorative jars. “And pretty art can make your space feel less utilitarian,” she says. Wallpaper is another good option. A fun print can energize your space, especially if you lack natural light. “A happy color or print can transform it so it’s not a place you dread going to,” Krason says. 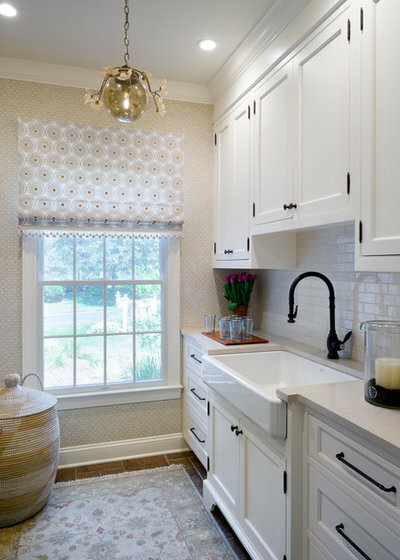 A tile backsplash is another way to add style. Williams says many of her clients keep the tile neutral so they can change paint colors more easily. And remember, laundry rooms are typically small, so the cost of wallpaper or even a backsplash may not break the bank. It’s a good place to spend a little extra to cheer things up. “You don’t have as much square footage as in a kitchen, plus there’s no cooking steam and splatter so you don’t have to worry about grout getting dirty,” Wheelband says. 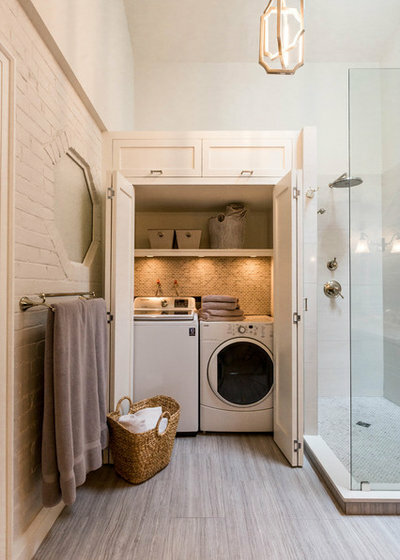 Margulis created this laundry room by incorporating the third bay of a three-car garage. A quartz countertop sits atop front-loading machines. Wicker baskets hold soap and dryer sheets. Window treatments, a decorative light fixture and a rug help create an inviting atmosphere. At this stage, the process for remodeling or making over a laundry room is similar to any other renovation project. You’ll be perusing floor plans, elevations and other relevant drawings. You’ll iron out the finer details and get a grip on what permits need to be pulled. If you’re working with a designer, he or she will probably help you interview contractors and get estimates on the cost of your project. Once you have that settled, you’ll begin preparing for installation by making sure you have all the materials on hand, as well as getting your space ready for demolition. Make sure you save all receipts, construction documents, warranties and product information so you can properly maintain and care for your appliances and other features. After your project is finished, walk through the space and make note of anything that’s cracked, chipped, broken or installed incorrectly. Get this list to the person who’s in charge of fixing these mistakes and include information about how and when the work should be completed. Now that your space is complete, personalize it with rugs, hampers, soap holders, art and more. Just remember that detergents and bleach can wreak havoc on materials. “You don’t want anything too precious in there,” Margulis says.